I am excited to share that my PET scan remained No Evidence of Disease (NED)! We were so excited and busy on Friday that I totally forgot to post on Caring Bridge – we just got on with life! Soccer games, play dates & a Hope Scarves party. It wasn’t until someone sent a friend a message today asking how I was doing that I realized I hadn’t posted anything on caring bridge. My apologies!! Thank you so much for your well wishes, prayers, encouragement and support. We are so grateful that we aren’t facing this diagnosis alone. Come what may – good or bad we are surrounded by so many people who love us and that is an incredible gift. And, for now we celebrate the good! Together. Thank you for caring for us on this crazy ride! I went back and read my last post this morning to give myself a boost and remember the feelings of carefree joy I was brimming with just a couple weeks ago. Life has hit us hard. I read the post to refocus my thoughts on gratefulness and remember how blessed we were to have had this summer together. But, the reality check has been a doozy. The kids are back in school and doing great. We love our school (Louisville Collegiate) and they are destined for a good school year with wonderful teachers, great teams, eager minds and a wonderful school community surrounding them. They haven’t missed a beat transitioning and that is huge. huge! But, the returning to reality of life with metastatic breast cancer was like running straight into a brick wall for me. I made my re-entry to reality by way of 18 hours in the car over a three day period (driving home from Michigan then to Alabama for a surprise party for a dear friend, visiting another friend and then back home for a baby shower of another dear friend)… all that driving caused me to have some major back pain and has left me still reeling in discomfort. Which has been hard after a summer of strength and good health. I have a PET scan tomorrow (Friday) to determine if the pain is caused by tumor growth. My first reoccurrence of metastatic breast cancer was found after a long car ride lead to back pain that simply wouldn’t go away… so I’m incredibly anxious. Still holding out hope that it is just bone (a side effect of treatment ) and muscle pain that was exacerbated by all the time in the car… I will keep you posted on what we find out. But, this is reality. The pain, fear and frustration. Someone asked me why I feel so good in Michigan and if I am trying to bring some of that back to Louisville. 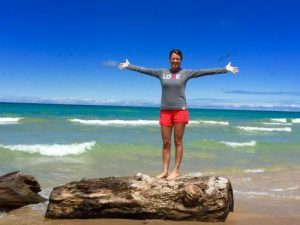 I laughed and said I think I felt so good because I simply checked out – I didn’t let cancer into our life in Michigan. However, that simply isn’t reality. Cancer is a big part of our every day, my past and my future. I wish I could live in denial – believe me it is a much happier place. However, it’s just not sustainable. 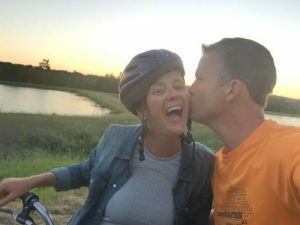 Yet, I crave the feeling of freedom I had this summer and I am working on what that balance looks like in “reality.” How to let myself be joyful in the moment while also living in the muck that is metastatic breast cancer. I hope tomorrow is a good day with hopeful news that this cancer remains NED (no evidence of disease). But, if it does show our first signs of progression (that we have been fearing for a year )we will dig in and make a plan to take the next steps. Determined to live our life to the fullest, one day at a time. The other day someone told me they missed reading my posts and were wondering how I was doing. 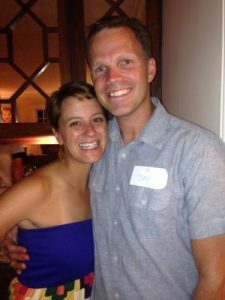 It was a nice reminder that people are praying and thinking about me and our family and I decided to take a moment to write and share an update. In a nutshell. Life is amazing. I am doing incredibly well and loving every single day. I continue to dance to my favorite tune with my buddy NED “no evidence of disease.” Which basically means the cancer cells stopped growing when we eliminated the estrogen which was fueling them. It doesn’t mean my cancer is gone forever. But, in the world of Metastatic Breast Cancer NED is the icing on the cake. No one knows (or will make an estimate) on how long this will last, so I have settled into my own happy perspective of one day at a time, living life to the fullest and allowing myself to hope this will last a long time! I take a daily medication called an Arimidex and have a monthly injection of xgeva. Side effects are hardly noticeable. I eat healthy, exercise daily and laugh often. Cancer is not in the front of my mind or influencing our day to day life as a family. I am so incredibly grateful for this. Most of all, I am happy. We – team mac – are happy! We are living life just like we did before the cancer came back. Even more so, we are living life big, loud, outside and not taking one single moment for granted. We have enjoyed another amazing summer on the shore of Lake Michigan. Every day I wake up and thank God for this amazing life. Each day is filled with adventures with my three boys- sailing, fishing, swimming, blueberry picking. Livin on “Lake time” is simple & stress free. And, I love it. We’ve also been able to travel spending lots of time with family at Brule Ridge in the UP, Petoskey & Fish Lake. Jay and I retraced our first anniversary trip with a 15th wedding anniversary trip to Lelenau Peninsula. Another weekend we took the boys on a northern michigan adventure that included a tornado in Glen Arbor, but ultimately evolved to be more fun then we could have planned with lots of impromptu stops along M22 including hiking in Nordhouse Dunes, a place Jay and I used to love to hike and camp. Staying in White Lake also allows for lots of time with dear friends and family. Although I think we have exhausted Nana and Grandpa! My favorite days start with a run in the trails and a swim in Lake Michigan. Many evenings end watching the sun sink into Lake Michigan with an ice cold oberon. I am incredibly happy that I can be here on my own. Jay comes up on the weekends, so I am on my own most of the time with the boys. Which no longer seems overwhelming or stressful. I love reading ghost stories all snuggled into one big bed together and hearing their feet run down the stairs as I sip my tea on the front porch. 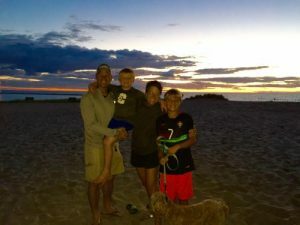 I love that I can do this on my own and be right there with them for each adventure- Paddle boarding, Lake Michigan baths, body surfing, dune climbing, sailing… Life is so, so good! I can confidently say we made the most of the this summer and our time together as a family. I made great memories with my three boys – getting caught in the pouring rain on a trail run, swimming in the moonlight, making big blueberry pancake breakfasts on the screen porch, swimming a 1 mile open water swim with my oldest, fly-boarding and so much more. I often want to grab them and say, “please don’t forget this. Please always remember me like this – healthy, full of energy, loudly laughing and swimming right beside you in the cold Lake Michigan waves.” They don’t realize how fleeting life is and how this could all change in an instant. But, why should they? I am glad that they don’t worry. We are just a happy family living life to the fullest & celebrating each day. I am training for a 200 mile relay run called the Bourbon Chase, creating a new website for Hope Scarves, writing our annual report, planning our Colors of Courage fundraiser, writing my speech as the next keynote speaker for Leadership Louisvillle’s 100 Wise Women (no pressure there…), serving on the board of the Parents Association, planning our family travels for 2015 and looking forward to all this coming year will bring. No longer consumed with fear, but brimming with gratitude for the good times we have and hopeful for more to come. Cautiously optimistic but also realizing how fragile life is. If all this comes crashing down I will know we didn’t waste one moment being sad or fearful. I am so thankful for this time together with family and friends, for my health and for spontaneous laughter. I don’t take any of this for granted. Please remember there are thousands of people facing cancer for which this isn’t possible. Hold them close in your heart and prayers. I have lost dear friends this summer, I have supported others whose disease is progressing and I have counseled newly diagnosed women. You can truly never escape metastatic breast cancer or any other advanced stage cancer, but I am living, laughing proof that you can live life over it. Allyson is the August 2015 Face of Hope from Erie, CO.